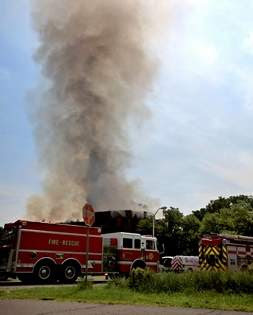 MIDDLETOWN — A six-alarm fire on Sunday gutted the hospital building of the former Middletown Psychiatric Center, drawing hundreds of firefighters from miles around. The fire, at 141 Monhagen Ave., broke out sometime about 6 a.m., according to Facebook postings. But official details were hard to come by Sunday, since firefighters were working at the scene into the night. Officials did not return several requests for information, and it was unclear if there had been any injuries as a result of the fire. Though the exterior of the four-story brick building remained intact, smoke poured from the upper windows well into the evening. The building, which dates back to the 1800s, has been abandoned for at least a decade, with no electricity or running water, said a woman who has explored inside on many occasions. Inside, Harper said, the stories of the former patients could be gleaned from old files and records that sat out in open cartons. Old beds, desks and tables were strewn about the interior, she said. Caskets were arranged around the perimeter of one of the rooms. A smaller fire broke out in late May in a storage building next door to the former Solomon Kleiner Center, once used for occupational and recreational activities. The state phased out the Psych Center in 2006, and most of the buildings have been left abandoned. The city, which is exploring a number of possibilities for redevelopment of the grounds, recently sold 7.5 acres to a Falun Gong-affiliated group that hopes to build a school of fine arts. In February, the Common Council approved a resolution to spend $10,000 to hire an engineering firm to do an environmental study on 13 state-owned buildings at the site.